Quick, simple connection between JB6 and all EDS bus masters with RJ12 jacks. Enables either parasitic operation or powered operation. Q: Confusion over the Pinout. RJ12 is a 6 Position plug, the pin out below only shows 3 wires in the pin out? Thank you for the inquiry. You are correct that a RJ12 plug has 6 positions. 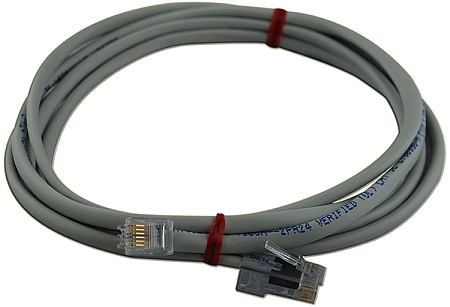 However, the RJC cable is designed specifically connect the EDS Bus Masters to the JB6 Junction box. To accomplish this only 3 wires are needed (1-Wire Data, Ground, and Power). Please note we no longer sell this part on it own. It is instead sold as an option for the JB6 Junction Box. Q: Will this become available? A: Thank you for the inquiry. We stopped selling this as a stand-alone product on our website. We kept getting orders from people trying to use this as a bridge between Ethernet and phone lines. You can still purchase the RJC cable by giving us a call (502-859-5490) or selecting the "Add RJ12 to RJ45 Cable" option when purchasing the JB6 Junction Box.